Superhuman fare X-Men Destiny, Spider-man: Edge of Time and Prototype 2 will get special attention from publisher Activision at this month's San Diego Comic-Con. The mega-publisher has one (possible) reveal planned for the show, teasing a "new 007 game" for the annual nerd gathering. Activision offers no additional details in its Comic-Con event invite, but it wouldn't be a surprise if that James Bond title was the recently outed Goldeneye Reloaded, a game that may have been unofficially revealed via its domain registration. Is Goldeneye Reloaded Just a Fancy Word for Rereleased? The publisher brought James Bond 007: Blood Stone to San Diego last year, the Bizarre Creations game that hit later in the fall. So what is Goldeneye Reloaded? A higher-definition upgrade of the Goldeneye 007 released for Wii last year sounds like a good guess. 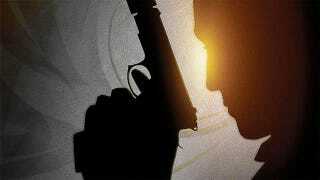 If not, maybe its Raven Software's take on Bond? It seems a bit early for the Sam Mendes-directed Bond 23 tie-in—the movie's not due in theaters until late 2012—but we'll know by Comic-Con.